It’s going to be powerful, cleansing, and health-bestowing. As I learned in my early years of time experimentation, like anything else – time is holographic in its nature. Similar patterns can be found in short and long time periods. For example, the 24-hour day has four points of axis: dawn, noon, dusk, and midnight. Similarly, the 365-day tropical year also has four axis points, namely the two equinoxes and two solstices. In one of his allusions to esoteric knowledge, Shakespeare once called sleep “the small death”. So what comes after the smaller death? So every day is a mini-cycle of life and death, and my tenure on planet earth is a longer cycle, with a similar arc of composing and decomposing. In other words, remembering someone from yesterday on the daily cycle is like remembering someone from a previous life on the longer cycle. But wait a minute. What about innocent civilians getting blown up daily in famous cities? They didn’t get a chance to grow old and depart surrounded by their loved ones. They left a gaping vacuum behind them, a trail of tears and despair. Car accidents, epidemics, hunger, allergies, and other manifestations of Kali (the dark and mysterious goddess of death in the Hindu narrative) all take their part in cutting short beautiful and promising lives. Should I draw comparisons between political terrorism and crashing a car under the influence? Like Alan Watts used to say, is there a clear line between what I do and what happens to me? If you ask the bereaved, there would be no difference between one cause and the other. No honor in one death and shame in the other. The reality of the bereaved is living daily with the void left behind by a loving spirit. If comparison is put aside, life cannot be cut short too soon or too late. On many levels life is continuous so it cannot be cut at all, long nor short. Birth happens right on time, why shouldn’t death happen in the same way? From the individual’s perspective, the show goes on till the actor leaves for good. The other actors, who cared and loved the departed, remain on stage and begin the next act without him. They change the plot in light of his death. There’s a hope for justice. A staving off of revenge. Somehow, the show goes on, and the curtains move by an unseen draft. I think it’s quite an improbable coincidence that 3 male support actors in the same TV series (Breaking Bad) share the very same Tzolkin birthday – 6-Kej. 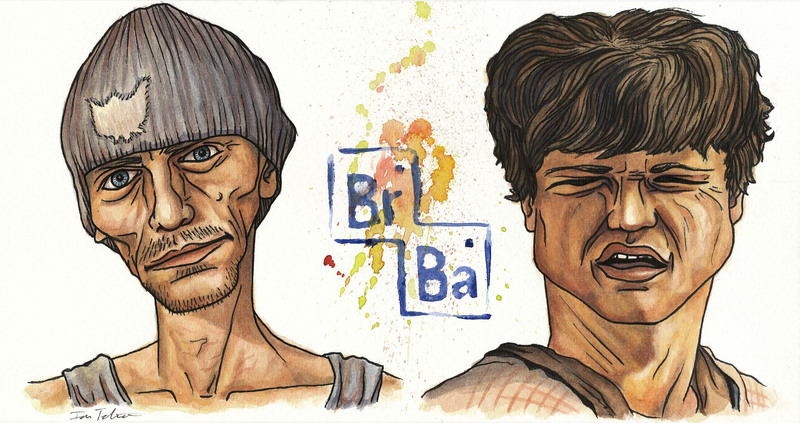 Out of these three gangsters, two (Matt L. Jones – Skinny Pete and Charles Baker – Badger) play side by side as partners most of the scenes. Two other male actors in the same series also share the same Tzolkin birthday. A day that took place only 10 days ago: 9-Noj. These are Brian Kranston and Giancarlo Esposito. When considering several different world cultures, Toj (Muluc in Yucatec) closely resonates with Water (and purification), Illusion, the Moon, and reflection as a broad concept. In the Theosophy-based Dreamspell system he invented, José Argüelles (10-Chicchan, last trecena) called this sun-sign “Moon” for good reason (if he was to remain loyal to his Blavatzky-an and Palmer Hall-ish roots). The crescent moon is the bowl or vessel by which the moon goddess, Diana the huntress with the crescent moon bow, draws holy water for her rituals of purification and regeneration, using the crescent again, this time as a feminine bowl. The moon also governs the waters of the earth, tides and ebbs, as well as the waters of women. A woman has 13 moon cycles each solar year. According to a famous Buddhist parable, the moonlight is reflected on the surface of the water, contained within many bowls. It appears that there is a moon in each bowl, so there are many moons. But this, of course, is an illusion. The moon doesn’t have to do anything to be multiplied. It just reflects the sun, and the water does the rest to complete the illusion. In Sanskrit, “Maya” means illusion, and it refers to the symbolism of this parable. In Hebrew water is “Ma’im”, in Arabic “May’ya” and in English this ancient root is where the words Mire and Mary originate. 1-Toj marks the beginning of the last 52-day period of the Tzolkin round. 260 days are divided into 5 equal periods of 52 days (four trecenas). Each such period begins on an eastern sun-sign and ends on a southern sun-sign*. The first period begins 1-Imox and concludes 13-E’, then 1-Aj to 13-Kat, etc. The last of these begins today 1-Toj and concludes 13-Ajpu. Fifty two is a quintessential Mayan number. According to Hunbatz Men (was he Hun-Ba’atz or Men? ), any wo/man in line to become a tribe elder must be at least 52 years old. Around that age women end their minstrel cycles, and men undergo their own physical transformation. It is said that at that age the focus of energy shifts in the body from the reproduction and lower realms up to the crown. That’s when one is able to see, judge and decide wisely. Fifty two is four times thirteen. Many cultures (ancient and present) mark the completion of the first 13 years somehow. It is the coming of age, the successful completion of childhood. It is First Communion, Bar Mitzva, and any such initiation rite into adulthood. This 13-year cycle continues to be observed in the Mayan culture. At twenty six the wo/man is ready for parenthood. At thirty nine another phase of adulthood comes to the fore. Then comes fifty two. Next is sixty five (retirement year in many countries) which is the first quarter of a new cycle, then seventy eight, ninety one and beyond. During the height of the Mayan culture the fifty two-year mark was celebrated as the Great Year. That’s when all the lights everywhere went out, and later rekindled to remain ablaze until another fifty two years elapsed. * In some traditions, the 260-day cycle begins on a nawal associated with a cardinal direction other than east. The main pattern is nonetheless maintained, since the 4 cardinal directions serve as a means of dividing 20 into 4 groups of 5. A tapestry is made of warp and woof. The way it’s traditionally produced is by using a loom. The warps are first wound on the loom, and then the artisan (one of the meanings of Chuen in Yucatec) takes his/her shuttle and begins weaving it, over and under, forming a weft row across the vertical warps. At some points along the row, the artisan changes the weft’s color, in accordance with the vision and plan in mind and body. Once one row of weft has been committed to the reality of the unfolding tapestry, the artisan begins a new row. The concept behind Ba’atz is deeply connected with this image of weaving. In this nawal’s symbolism, the warp is reality as it is already manifested now, through my past works, the those of my ancestors. It’s the loom. The wefts are new ideas that the artisan colorfully weaves over and under the anticipating, given warp threads on the loom. The artisan is the shuttle, and the vision, mind, and skillful hands that deftly put the shuttle to honest work. Ba’atz types are known for this talent to take their ideas, visions, communication skills, and artistic flare, and weave them into their own reality, as well as into the realities of many people around them, in their various communities. They also have a child-like knack for picking up new fields of interest more quickly than others, and these interests are often completely different from one another. After the artisan has learned something new, he is known also to have a talented and inspired ability to teach others to master whatever he has learned, even though the artisan him/herself might never achieve mastery equal to that of their loyal students. Like the simian howling ‘Baaa’aaatz!’, echoing through the Central American jungles, and hovering from one tree to the next with accurate skill and effortlessness – Ba’atz types know a lot about many different subjects, and are masters of putting these skills to work to create new and highly creative realities. When he was talking, which was seldom, Sri Ramana Maharshi used to say that silence is the most powerful mode of communication.